Most children hear and listen to sounds at birth. They learn to talk by imitating the sounds they hear around them and the voices of their parents and caregivers. But that’s not true for all children. In fact, about two or three out of every 1,000 children in the United States are born with detectable hearing loss in one or both ears. More lose hearing later during childhood. Children who have hearing loss may not learn speech and language as well as children who can hear. 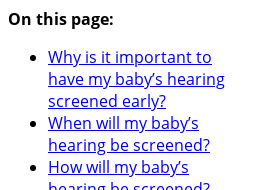 For this reason, it’s important to detect deafness or hearing loss as early as possible.